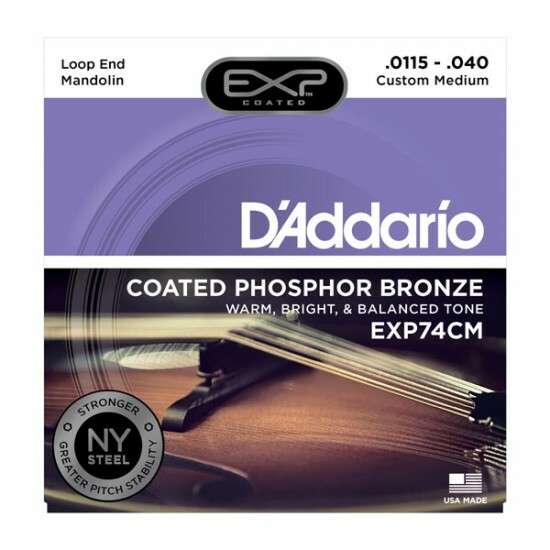 EXP74CM, D'Addario's new custom medium coated mandolin set, is a custom gauged combination of the EXP74 and EXP75 sets. Warm and bright phosphor bronze tone with the optimal blend of tight playing tension and strong projection. Loopend construction for universal fit. The custom strings have a higher tension/tight feeling when you are picking. They have a very warm quality sound that I love, and they last up to four times longer than the competitors! I highly recommend them! Good price and fast service. Easier than buying at the music store. order came quickly and in good order. no problems encountered. coated strings not available in local music store. like to buy local, but small selection for mandolin. these were new custom set and seem to have some tonal benefits. thanks for the service.